Early last year I had the chance to spend some time vacationing in Hong Kong. One of the things that I truly enjoyed there was the avalanche of option you have for food. I had the chance to try a plethora of local and non-local cuisines, and was deeply impressed by the wide array of variety. I’d like to share here are some of the favorite local eats I’ve had the chance to taste. Mind you, these are just the local eats, I’ve tried plenty other food as well, such as Japanese, Italian, Korean and the usual Western. My very first meal was at this wanton mee (dumpling noodle) stall I encountered on my exploration around the area where I stayed. I was alone, and had no clue. But then I saw Anthony Bourdain’s face plastered on the walls of this quaint noodle stall. Perfect! If Anthony enjoyed it, then I’m sure I couldn’t go very wrong. The noodle was indeed tasty, and the soup flavorful. The humongous shrimp dumplings were fabulous as well, I think they actually fitted in two shrimps onto each dumpling! Can’t ask for a better start to my holiday. This street-side stall nearby my motel was frequently packed with locals looking for a quick snack. I ordered a small bowl just out of curiosity. Never got to know what it really was as they spoke with me in Cantonese – one of the advantages (or is it disadvantages?) of looking like one of the locals. Some seafood stuff I suppose. Tasted great, a bit chewy. But it was extremely hot! Very very spicy, be warned! I had to grab an emergency drink right away as the spiciness caught me off guard. This snack definitely goes down well in HK’s breezy winter. 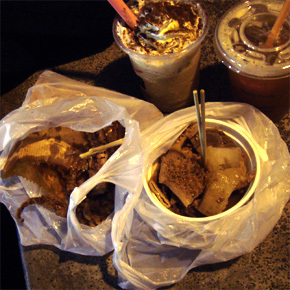 One of the night I had the chance to meet with an old friend and we caught up over supper of these street-side snacks – pig’s organs (I think) on the right and deep fried squids on the left. 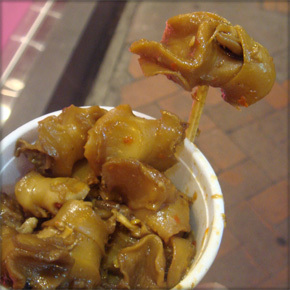 In Singapore, the pig’s organs would come serve with soup and kway chap, not served by itself like this. I was intrigued as well to find a street soccer field in the middle of bustling Mongkok. We supped and chatted while watching a local championship battle ensue. Again at Mongkok area, had the chance to dine at this makeshift restaurant in the middle of the street. Apparently some of the streets close at night, and these restaurants pops out of nowhere serving you such deliciousness like various seafood, hot pot rice and meat. The clams was a personal favorite. 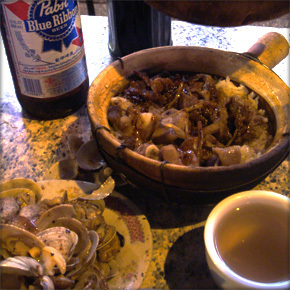 They were cooked with chinese cooking wine, usually a Cognac XO, which gives it a unique sweetness comparable to none. I wanted to try one of the steamboat but they were full. Ah well, another time another chance. One of my favorite things to do in HK was to pop by one of the many branches of Hui Lao Shan desserts stall and grab a serving of delicious mango smoothies. I would order a bowl to savor on the spot, and order another one to go. No wonder I gained so much weight! 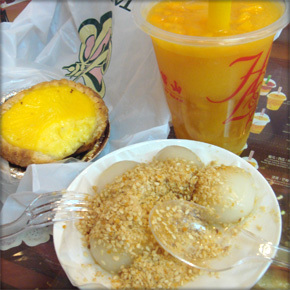 This particular time, I pampered myself with a breakfast of egg tarts, sweet glutinious rice balls (tong yuen), and my favorite mango smoothies. The glutinious rice balls are usually served as desserts instead of breakfast, but I just couldn’t resist. 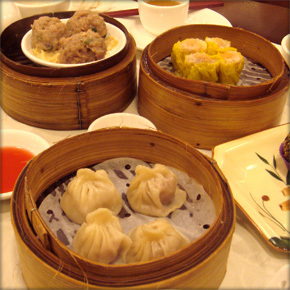 A trip to Hong Kong wouldn’t be complete for me without trying out their delicious dim sum. That would be like going to Phillies and missing out on their famed cheese-steaks – simply unacceptable! So I was very fortunate that a friend of mine was able to take me to this dim sum place recommended for its quality and price. I’m glad to report that the dim sum in Hong Kong are every bit as delicious as they proclaimed to be. 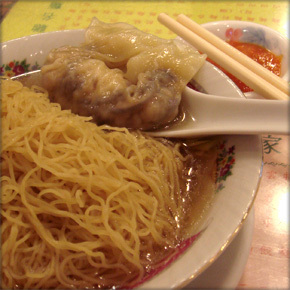 And doubly glad to say that I also find Singapore dim sum just as sumptuous! Featured on the photo are servings of xiao long bao (front), siu may (top right) and something else I can’t remember. Finally, I had a luxurious dinner on my last night in Hong Kong. 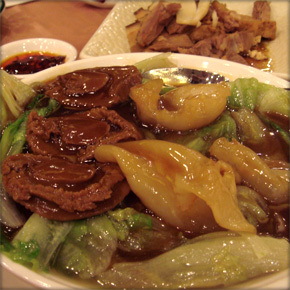 This dish featured here was the culmination of that dinner, the main entree – braised abalone with chinese cabbage. Apparently, this dish is right up there in the social pyramid of Chinese food, along with such delicacies as shark fin soup and birds nest soup.